Yes I did just say that the Mazda2 is 100 hp of joy. It’s not a typo, that little car really does run on 100 hp and I really did love driving it. 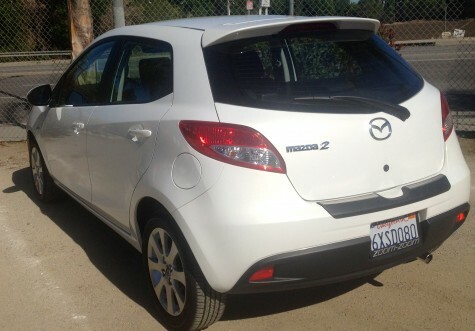 They say it’s more fun to drive a slow car fast than to drive a fast car slow and if you live in a city like Los Angeles where traffic can be prohibitive the Mazda2 just might be the perfect solution for your city needs. First off, everyone loved the look of this car. It’s cute without being diminutive. The Mazda2 manages to be subcompact and attractive while still appealing to the XY set. The interior of the Mazda2 isn’t particularly luxurious but it isn’t bare bones either. The dash is small because of the size and structure of the car but it’s got everything you need and it makes sense. I drive a lot of cars and the first day of a switch can be a tough one. As I had experienced with the Mazda 3 the controls are ergonomic, sensible even, and my hands just sort of knew where to go leaving my eyes on the road. The Mazda2 is has a pretty rigid structure. You feel the road in a way that’s a bit uncommon in a Japanese import. I happen to really enjoy this type of drive and when you’re in a tiny car with very little power the feel of acceleration can be exhilarating. Speaking of exhilaration be sure to opt for the manual transmission. There’s a lot of pep in this little package and I found myself wanting to race at every green light. I wasn’t dangerously close to the red line and I was able to make this little car hop into action quickly. Please imagine me in the Mazda2 with anywhere from 2 to 4 kids and their backpacks in the car revving the engine as a light turns from red to green. The kids were basically screaming, “You’re the worst driver in the world” and I was just laughing and enjoying myself and making them listen to 80’s music because the Mazda 2 made me feel like a teenager without any of the angst. 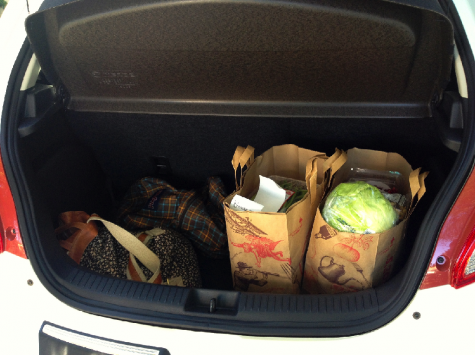 Since it’s a hatchback the Mazda2 will carry all your gear. We had an electric guitar in there one day… that was a little cramped. There’s the obligatory fold down seats so if you don’t have any passengers you can probably put half of everything you own in the trunk. The 2013 Mazda2 hasn’t received it’s star ratings yet from NHTSA but I absolutely will update this post when they come in. I’m impressed with some of the safety innovations and will have a separate post about Crushable brake pedals and Collapsable steering columns and why they keep you safe (particularly in smaller cars). The price point is fantastic. I drove the absolute base model and the price including delivery and $200 worth of upgraded paint was $17,285. I’m not clear on what upgrades are available but I wasn’t feeling like we were missing anything. This is a great basic car. Add to that 32 MPG combined city and highway and you’ve got a very affordable vehicle that should last you a good long time.